+ Both quarterbacks did a good job with the offense. Both flashed at times. Justin Fields didn’t get to show as much of his running ability as he can because of the rules. Both QBs had positive days. + The energy was good throughout camp and the team got tougher. + Quarterback development is a progression and no matter how much you prepare, you can’t simulate game action. The more prepared you are, the better you will do, however. + Asked for a QB pecking order and Day said he didn’t know and didn’t expect to make any decisions soon. + Asked for his biggest concern leaving spring camp and Day said offensive line and quarterback because of depth issues and lack of experience. 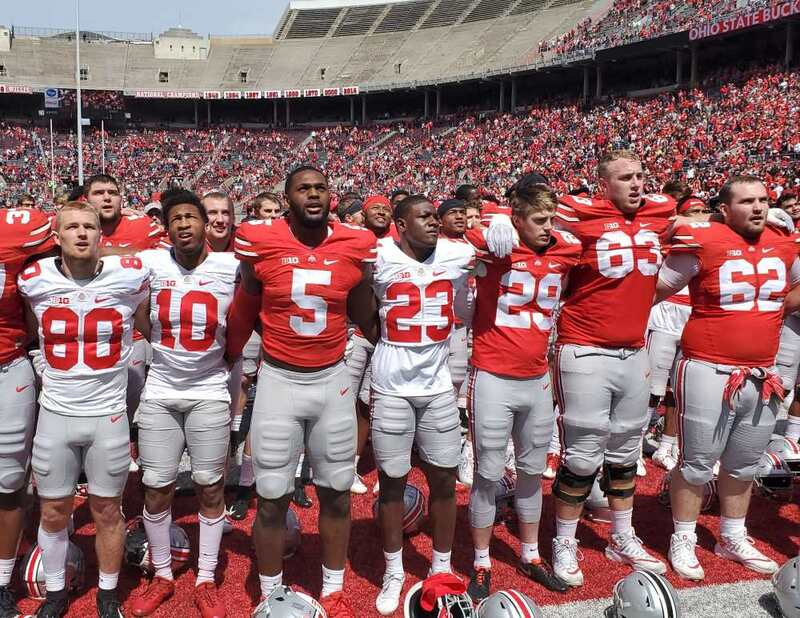 + Joe Burrow and Dwayne Haskins hadn’t played much, but they had practiced a lot, so he had a pretty good idea of what they would be able to do. He doesn’t have that same knowledge of his quarterbacks this spring. + The quarterbacks have gotten more comfortable throughout the spring. They stay in the pocket longer after being “shook in there” early on. + Hill has seen a lot of growth from Garrett Wilson from the day he walked in. He has also developed as a person and is growing up into a man. “I feel like that’s why he is making those plays.” He’s humble and coachable. + Anything that needs fixed will get done by the time the season starts. + He had ups and downs throughout the spring. He just has to keep improving and keep working. + He needs to work on every aspect of his game. + It was fun today being in front of the Ohio State crowd. + “I’m not necessarily trying to fill Dwayne’s shoes.” He’s just trying to do what he can to help the team. + He sees plays sooner now and knows what is going to happen, which wasn’t the case last year. + He knows he’s not a freshman anymore, which means he has to be a contributor and step up this year. + He has stepped up this spring by going hard and working on technique. Trying not to make the same mistake twice. + This spring for Young was about refining his technique. For the defense as a whole, it was about building confidence. + Tyreke Smith and Javontae Jean-Baptiste have superstar potential, but he tells them to work hard because there’s always somebody working harder than they are. + Zach Harrison “really doesn’t have a ceiling. He can be as good as he wants to be.” Just needs to keep working. Fields won’t be 1-and-done as he is only a true sophomore. Stop with all the QB competition talk. Just like last year it is predetermined who the starting QB will be…Fields is the highest ranked QB ever to sign with Ohio State. He did not come to the school without guarantees. Fields was highly sought by other schools and chose Ohio State because he would start. I wish I could argue with you, but I see the writing on the wall as well. Feel bad for Matt Baldwin because I’m sure he’s a good QB but it ain’t gonna be in Columbus unless Fields turns into a 1-and-done as well.